After the boom of clay masks late last year, I thought that sheet masks would soon lose their popularity among skincare enthusiasts. But. I. was. dead. wrong. I’ve noticed so many new sheet masks cropping on up on Watsons’ shelves, and it made me realize that what started as a K-beauty trend has found a permanent spot in our routines. It makes sense though: it’s an easy and often affordable way to indulge in 15 to 20 minutes of pampering and me-time. With so many new variants to choose from though, which one do you start with? I tried out a few so you know what to try for your next self-care sesh! I was on the verge of stopping my weekly sheet mask routine until Dr. Morita came into my life. I still feel like this is a magical sheet mask that delivers the perfect chok-chok look, as it brightens and nourishes my skin. My face looks and feels so plump and bouncy after each use of literally any of the six variants. The Taiwanese mask also swims in such a generous pool of essence that I can cover my whole body with it, twice! I just wish that all the sheets would have the same cut as their black sheet variants (in gold and silver packaging) since the white sheets have rather odd eye and mouth hole locations. My personal favorite is the Platinum Colloid & Hematite Extraction Whitening Black Facial Mask! I remember trying Beauty Buffet way back in 2015 or 2016, and they have repackaged and seemingly reformulated their masks since then. Their Cherry Blossom Brightening Mask provides a brightening and moisturizing effect right after use. The thick cotton sheet feels a bit uncomfortable but still clings to my face well. My skin absorbs the essence well and doesn’t feel sticky after. These Taiwanese masks are almost always on sale so it’s makes weekly sheet masking habits easy on the budget. Another Taiwanese brand, it actually has a cult following in the skincare community! My trial of the 10 in 1 Herbal Extra Pore Minimizing Black Mask was a pleasant surprise, and helped me understand why their masks are so popular. Opening the pack immediately released a sweet floral scent that I really liked. The mask material is a bit on the thick side and therefore did not have or need extra plastic backing, plus the fit felt like it was tailored to my face! Upon removal, I found that it left my skin so bright, soft, supple, and amazingly, not chok chok. It did a great job of hydrating my skin but instead of a shiny after-mask glow, my skin looked matte and poreless after! The essence absorbs so quickly and doesn’t leave any tack at all. I would hoard this if budget allows. Face Republic is one of the newest K-beauty brands to arrive in Watsons and the super affordable prices got me interested in them. 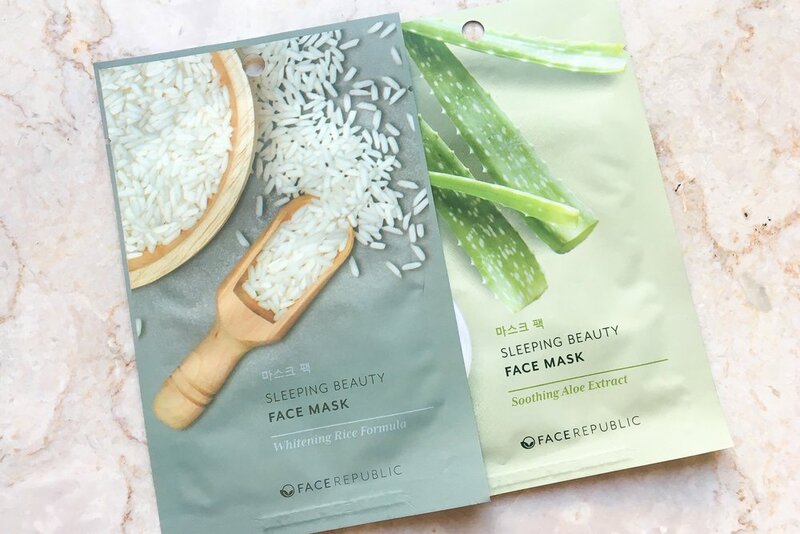 Sheet masks are a good option for trying a brand for the first time, so I tested the Sleeping Beauty Face Mask in Whitening Rice Formula. It features a thick cotton sheet mask and a slightly more viscous essence than I’m used to, but I was surprised that it really did make my face look super bright! It gives just enough moisture and no chok-chok action, but the radiant effect it gave my skin made me think I should have used this before doing my makeup for the day rather than just before bed. Cathy Doll is a Thai beauty brand that has been in the PH for a good two years now but came out with this line of Feeling Mask Sheets earlier this year. The super cute packaging turns makes them look and function as greeting cards, with a blank space for you to write the name of the recipient and a short note. It’s a simple but thoughtful gift! I used the Miss You Snail Mask Sheet which comes with a good amount of essence and was even a bit drippy. The mask itself is quite thick but the cut fits my face well. My face felt slightly sticky even after the essence had settled but it did look brightened and moisturized. Watsons has a lot of in-house brand sheet masks, and this is one of the newer ones they’ve released. The Vitamin C Whitening and Moisturizing Facial Mask is so moisturizing that it allowed me to apply a heavy matte foundation without caking on or drying up my skin. The sheet itself is so very thin that it almost disappears on my skin once applied, and the blue plastic backing is really necessary to keep it from accidentally getting torn. The mask also swims in a pool of essence which feels slightly tacky even after absorption. I didn’t notice a brightening effect but the moisture it gave is enough to make the price well worth it. Michin Skin or Crazy Skin is the most unusual of this bunch because it’s actually a wash-off sheet mask! The instructions say to apply the mask for 5 to 8 minutes, remove and let the essence dry for about another 10 minutes, then rinse in water. The sheet mask itself was also very weird because instead of a plastic backing, it had a whole plastic gauze that felt like a waste of plastic. It strangely also felt like a clay mask in sheet form, with a clear but very sticky essence that stiffens like egg whites as it dries. After washing, it left my skin feeling so tight! It was an interesting experience but my favorite part is the included eye cream. It was lightweight but richly moisturizing! There’s a generous amount of eye cream product in that small packet, so while this mask is pricier than the others, it’s not a bad deal. I was most excited to try these masks because my first ventures into skincare was with Ponds! I tried the Skin Brightening Serum Mask and the signature Ponds scent made me reminisce my younger years. The essence felt a bit tacky but is negligible for me since it was like a very heavy serum that made my skin feel very moisturized. It gave 200% chok-chok glow to my skin! I think those with more mature skin will like this mask better because as the packaging promises, it packs 30x serum intensity. There is a catch though: the sheet mask has a very poor fit. The eye, nose, and lip holes are all much too big, and sheet itself is very thin and fragile but the lack of plastic backing makes it prone to tearing and stretching. Have you tried any of these masks yet? What was your experience with them?